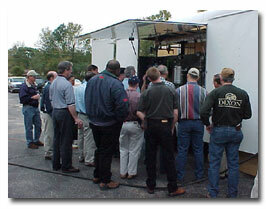 The CAROLINA STEAM SPECIALTY COMPANY mobile Steam Training Lab is equipped with boiler, glass piping, steam devices and other instruments and controls. Instructors use this working steam system to demonstrate the nature of steam and how steam devices can be used to control steam and condensate. We bring our classroom to you. 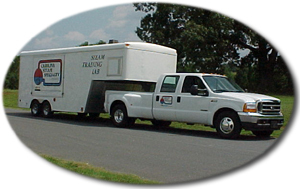 Our Steam Training Lab trailer is brought to your location and parked at a convenient site at your plant or office. 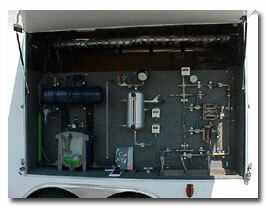 Trailer doors are opened to show the various piping panels and demonstration units. The Basic Steam Seminar allows the participant to learn the basics of steam from a fully functional operating steam system equipped with glass steam lines, glass condensate lines and glass steam traps - all functioning with live steam. This seminar covers steam tables, latent heat and sensible heat, flash steam, air and vacuum in a steam system, proper piping and valve basics. You will see inside a steam system and understand that in steam: "IT ALL COMES DOWN TO THE BASICS." The Advanced Steam Seminar is a full day session with classroom instruction and live steam demonstrations with our fully functional steam system featuring glass steam piping, steam traps, flash tanks and condensate return pumps. Topics covered are: proper piping in a steam system, steam trap selection and placement, steam separators, steam quality, water hammer, flash steam systems, steam pressure reduction and temperature control, safety relief valves, steam equipment piping layout and design, condensate pumps and return systems. From this seminar you will be able to reduce energy cost and maintenance, decrease downtime and properly design steam equipment installation for maximum productivity. You will understand how all types of steam system components work and how to apply them to fully optimize the performance of your steam system and heat transfer equipment. Steam Traps is the most "Hands On" steam trap and steam trap maintenance training program available. Participants will learn how to select, install, test, troubleshoot and repair all types of steam traps. Observe all major types of steam traps in full live steam operation using our glass bodied steam traps, glass piping system and trap rack. Presented in an easy to understand and straight-to-the-point format. *All of these programs are presented by speakers with over 20 years of hands-on field experience. TEAM SPIB, a training center for manufacturing and grading of southern pine lumber, recently held a course for dry kiln operators. 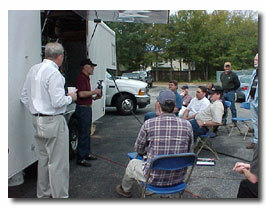 This course covered all aspects of drying southern pine lumber. Carolina Steam Specialty Company graciously agreed to do a demonstration on how steam works, and troubleshooting problems with steam systems. The hands-on demonstrations exhibited on their demo trailer, along with their thorough knowledge of steam, captivated the participants in the course. Being able to actually see the steam move through the system, change states, and be recovered as condensate, opened a lot of eyes. Response from the participants in the course echoed our feelings that the steam demonstration by Carolina Steam Specialty Co. was an excellent learning experience for anyone who works with steam.